NFL week 14 games will kickoff Thursday, 12/8, with this season’s first installment of the Turnpike Rivalry: Cleveland at Pittsburgh. Staying true to the rivalry’s form over the past decade, this AFC North matchup will see the Pittsburgh Steelers, full of playoff aspirations and talented lineups on both sides of the ball, hosting a Browns team in the middle of another disappointing season marred by injuries and an overall lack of energy and enthusiasm. Despite being out of the AFC Playoff hunt, the Cleveland Browns will arrive at Heinz Field with the intention of winning their first of two games this season against the hated Steelers, this time on Thursday Night Football. Cleveland at Pittsburgh has ended in a Steelers victory every year since 2004, and the Browns have only won three times total versus Pittsburgh since 2000. The stability offered by the Steelers legacy and tradition is in stark contrast to the ever-changing coaching, front-office leadership, and starting rosters for Cleveland over the same time period. Despite the differences in record, the ticket is still the third most-expensive to get for NFL Week 14, costing over $179 on average. The conference’s oldest rivalry – this will be the 118th game between the two – makes for a very tense border war between Pennsylvania and Ohio, even creating “house divided” scenarios as you often see in the most heated college traditions. Some of the most famous Steelers, both past and present, hail from Ohio, only adding to the familiarity and contempt fueled in this annual home-and-home divisional series. Former Steelers and Super Bowl Champion coaches Chuck Noll and Bill Cowher have roots in Ohio, current Pro Bowlers Ben Roethlisberger and James Harrison hail from the Buckeye State, and Hall of Famer Jack Lambert grew up and played college football there. Will the new Browns coach Pat Shurmur lead his team to an upset by the Three Rivers, or will Steelers coach Mike Tomlin keep his men focused for 60 minutes and continue on their path to another playoff berth and a chance to return to the Super Bowl? Get your seats now for this heated rivalry – there’s enough energy in the stadium to warm you up on the coldest December nights. Heinz Field will welcome the NFL Network’s national broadcast with a stadium full of black and gold with Terrible Towels waving in every section. While the Steelers faithful have developed a long waiting list for season tickets, there are still some great seats and deals to be found on ticket reseller sites. 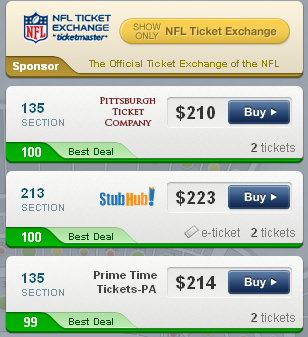 SeatGeek conveniently searches the most popular ticket listings for you at once and combines the results to help you find the best deals on Cleveland at Pittsburgh tickets possible. 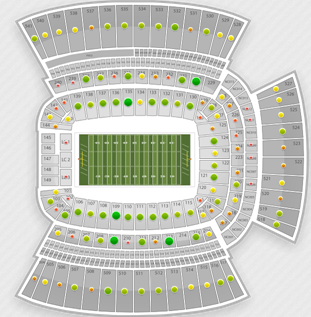 Start your search for Browns – Steelers tickets with this snapshot of the highest deal scores and find the best seats for you!